Winner of an iParenting Media Award When there is a child with special needs in your family, it can be easy to overlook your own needs, desires, and dreams, or those of the ones you love. Long-awaited and much-needed, this book addresses the real-life impact a special needs child has on family relationships. Author Nick Martin gives well-researched and heartfelt advice on avoiding the blame game, finding support and guidance for all family members, managing financial challenges, improving communication, sharing responsibilities, being intimate, and more. Stories and testimonies from real couples further validate Nick's sound advice. 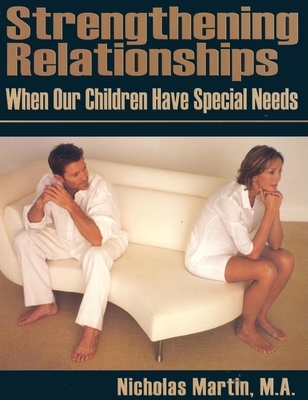 Taking the time to repair and strengthen your family's relationships will benefit all involved.Helpful chapters include: Avoiding BlameSupport and GuidanceAffordable Child CareMoney MattersTime AloneEffective CommunicationChild Rearing and DisciplineSex, Affection, and IntimacyPotentials. Nicholas Martin, MA, graduated from the University of Pennsylvania with a BA in Psychology and then attended the University of Hartford, where he graduated with a Master's degree in Clinical Practices. After many years as a juvenile court psychologist, outpatient mental health counselor, and dispute mediator, he has come to focus increasingly on IEP collaboration and conflict reduction in special education. Founder and President of the nonprofit organization The Center for Accord, he is currently a staff development and conflict resolution specialist, working as a mediator between families and schools to make sure everyone's needs are met as practically and positively as possible. He provides seminars and workshops nationwide to thousands of special needs educators and families, in both English and Spanish.